As of 3rd Oct 2018, Jetstar NET rates will no longer be sent from ResOnline as requested by Jetstar. 5. Login to your Jetstar account after 3-5 mins and ensure that rates are inline with current pricing. 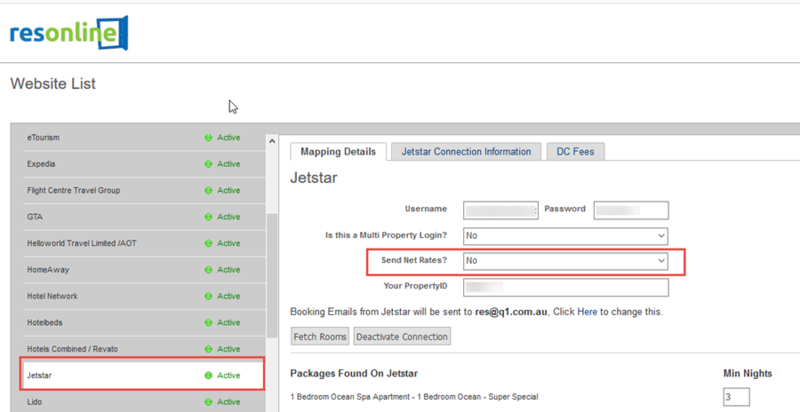 Should your property not action this request by Wednesday 3rd October 2018, then ResOnline will action this change as requested by Jetstar. ResOnline store Gross rates in the yearly/monthly deals calendars. Once "Send Net Rates" are set to NO, ResOnline will be sending Gross Rates to Jetstar. If you still wish to send different rates, Rate adjustment percentages & Channel overrides can still be applied for Jetstar in the ResOnline. Please ensure that you cross reference your rates in the Jetstar extranet once this change is complete.